According to Diebold professor of Indo-European linguistics and philology Jay Jasanoff ’63, Ph.D. ’68, “I don’t come from an academic family”—and yet, since arriving at Harvard as a freshman, he has become part of a remarkable dynasty of Harvard-educated scholars and faculty members. Wife Sheila Sen Jasanoff ’64, Ph.D. ’73, J.D. 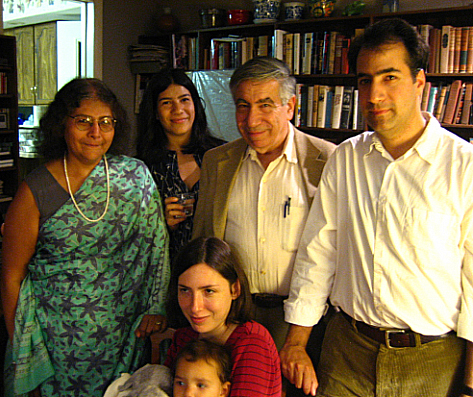 ’76, is now Pforzheimer professor of science and technology studies at the Kennedy School; their daughter, Maya Jasanoff ’96, is an associate professor of history, and their son, Alan Jasanoff ’92, Ph.D. ’98, is an associate professor of biological engineering at MIT and a tutor in biochemical science at Harvard. Although Jay and Sheila were at Harvard and Radcliffe as undergrads at roughly the same time, they met not in Cambridge, but by chance at the University of Bonn in 1963, where both were studying linguistics. Jay has continued in that field—his most recent book, Hittite and the Indo-European Verb, is concerned with reconciling apparently anomalous evidence from the Hittite language with the Proto-Indo-European verbal system. He is also former chair of the linguistics department. Sheila has been a pioneer in a field that combines elements of science, public policy, politics, and law. Science and technology studies programs generally were not established at American universities until after World War II, but the problems they examine are those faced by any culture and state. Asked for an example of one of the modern issues she works on, Jasanoff brings up climate change as an example of differences in the political cultures of democratic societies: German scientists have presented the case for man-made global warming, and, in keeping with a society inclined to consensus, the German people have accepted it as fact. The U.S., Jasanoff says, is “a more adversarial culture”—even though most scientists think that climate change is imminent, and indeed already beginning, many of their fellow citizens reject the idea. One of the key responsibilities of her field, she says, is to study these differences, which in this case arise from the ways societies evaluate evidence from experts and policymakers. "STS asks the 'should' questions," Sheila notes, confronting complex, morally ambiguous problems in everything from biotechnology and climate change to expert advice and scientific evidence. Although Alan, after graduating from Harvard, defected to MIT to work on biological engineering, his younger sister, Maya, returned to the Harvard nest (after picking up a master's at Cambridge and a Ph.D. at Yale) as a scholar of British history, particularly in the eighteenth and nineteenth centuries. Her first book, Edge of Empire: Lives, Culture, and Conquest in the East, 1750-1850, examined the way the British empire accommodated cultural differences in its colonies, focusing on diplomats and soldiers who collected local artifacts. Her next book, due to be published in February, examines what happened to American loyalists who fled the country after the Revolutionary War. She describes her family as "very different from the traditional old Harvard families, the Cabots and Winthrops." This is undoubtedly true—her mother emigrated from India in the 1950s, and her father's family came from Poland—but there are certain benefits that come from having parents as scholarly as hers. She laughs and recalls their contributions to her new book: "My mother proofread the draft… And my father came up with the title, Liberty’s Exiles." Not that she couldn't have done it on her own.